A sponsored cycle ride from Minnis Bay to Reculver to raise funds for "Beach within Reach" which provides all-terrain wheelchairs which can access the beach..
Encouraged by the beautiful weather, a large turnout of cyclists met at Minnis Bay to participate in a sponsored cycle ride to raise funds for “Beach Within Reach” a local charity which provides all-terrain wheelchairs to be used at beaches all round Thanet. The wheelchairs have special “balloon”-type tyres which mean that they are very easy to manoeuvre on sand or shingle and are free to use by anybody with a mobility impairment. The charity is currently replacing all of its wheelchairs with improved versions like the one in the photograph above and was delighted to receive £500 as a donation from the cycle ride sponsorship. The cyclists set of from Minnis Bay along the coastal path to Reculver, the half way mark, where refreshments were available. After the return to Minnis Bay, many of the cyclists enjoyed lunch at a beach hut. 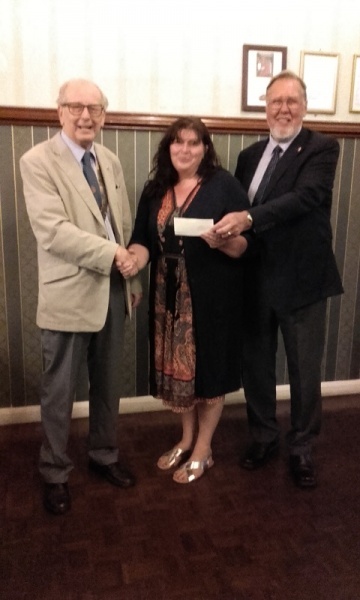 This fund-raising activity is typical of the events organised by Rotary in Westgate & Birchington, providing fun and fellowship while serving those less fortunate than themselves.